Last week I started blogging about my Kickstarter campaign to get funding to produce and print my graphic novel, Transreality. This week I’m going to tell you about some of my more successful backing strategies, while going over my backer levels and why I chose the pricing and incentives I did. Backer levels are what it’s all about. It’s what your backers get if they get involved with your project. You have to entice. But you also have to be reasonable. How much is it going to cost you? If it’s something you mail, what are those costs? I’ve read about a few people that didn’t factor that in and had a hard time delivering what they promised. $5 – A Bit Curious – You’ll receive access to the blog, a backer credit in the book and the creator’s undying love. This is just for folks that like you personally, but don’t necessarily have a lot of money. Or maybe they’re not really interested in your subject, but they want to see you succeed. I currently have 3 backers at this level. $10 - A Digital Consumer – You’ll receive access to the blog, a backer credit in the book, AND a PDF copy of the finished 128 page graphic novel. We live in the future. People want to consume their stuff digitally, be it iPad, Kindle Fire or just on their computer. Plus this is great for folks who want to enjoy your product, but can’t afford to put in some serious money. This level makes your project accessible, which is very important. $13 - A Little Something Extra – You’ll receive access to the blog, a backer credit in the book, a PDF copy of the finished 128 page graphic novel AND a Kickstarter exclusive wallpaper for your computer. This is one that my wife suggested from other people’s Kickstarter campaigns. It’s a little extra money, but it’s something that is only available at this level. Something special for the low-end contributors. $20 - The Real Deal (UK) – You’ll receive access to the blog, a backer credit in the book, a PDF AND a signed and numbered physical copy of the graphic novel (UK postage included). This is what’s it’s all about. The physical printed copy of your graphic novel. I think it’s important to include your shipping price in this figure, so the backer knows exactly what they have to pay to get the book in their hands. $26 – The Real Deal (Worldwide) – You’ll receive access to the blog, a backer credit in the book, a PDF AND a signed and numbered physical copy of the graphic novel (Worldwide postage included). I’m based in the UK and I’m doing my printing here, so all my shipping prices will be based from the UK. I thought it was important to just have two levels of shipping difference to keep it simple. Most of this shipping will be to the US, so it’s based off that price. But to ship to say… Australia is a bit more expensive. I don’t expect many from that far away, so I’ll just eat the extra cost of those, if there are any. $35 – The Real Double Deal – You’ll receive access to the blog, a backer credit in the book, a PDF AND two signed and numbered physical copies of the graphic novel – one of them gift wrapped for that lucky someone (UK postage included). *For non-UK shipping please add $6 to your pledge. This is another one that I saw on someone else’s Kickstater. It wouldn’t have occurred to me but you save a bit of money on shipping doing it this way and you’ve got someone being an advocate for you. Giving away your book as a gift. Pretty neat. $40 – Behind The Scenes – Blog access, backer’s credit, PDF and print copy, AND you’ll also get special, behind-the-scenes updates every two weeks! With this level of backing you will get to look at pages in progress, see script changes, and know what’s going on in my head as I work on this project! This will be an honest look behind the scenes to see what goes into making Transreality. And you can give input! This is something that will require a bit of work in the future, but I think it’s really worth it. I’ve got a decent camera and I’ve done a lot of video work, so the plan with this is to let Backers into the process. As I’m working on the book I’ll talk a bit about layout and story and whatever problems I face during this process. This is for the people that might already be fans of whatever it is you do and just want to get to know you a bit more. Or learn from your mistakes and successes. $50 - A Copy of the Script – Blog access, backer’s credit, PDF and print copy, behind the scenes access AND a limited edition printed copy of the script Transreality with notations. These will only be made for the kickstarter, then never again! This one I stuck in because I’ve always loved to read scripts and to see how the script varies from the final project. Plus the script notes offer more insight on the writing process. $60 - UK RETAILERS ONLY – 5 printed, signed copies of the completed 128 page graphic novel (shipping included). This is approximately £6 per book + shipping. An option I put in to get local retail support. After talking to a few more stores, something I should have included in there is a poster to be put in the store (I think I can still do this if I don’t have any backers yet). Of course stores have to sell the books to make a profit, so I lowered the cost to reflect this. $75 - A Mention – Blog access, backer’s credit, PDF and print copy of the graphic novel, special, behind-the-scenes updates every two weeks, a print copy of the script, plus YOUR NAME (first or last, your choice) will come up somewhere in the graphic novel. Where? I can’t say. It could be the name of a company, a character in the comic, maybe someone stubs their toe and uses it as an expletive, I don’t know. It’ll depend on your name! A lower, high-end perk. This is where the Backers can start to really feel involved in the project and that it really becomes theirs. Pricing was hard on this as it’s special, but not that flashy. $100 - A Cameo – You will receive access to the blog, a PDF and physical copy of the graphic novel, ‘Behind The Scenes’ updates, a print copy of the script, plus YOUR LIKENESS will appear somewhere in the graphic novel! You might have blue skin or scales, but it will be recognizable as you! A few photos will be required to participate at this level. This has been the most successful. And I would recommend everyone who does a Kickstarter for a graphic novel to do this. People get really excited by this and seem more than happy to pony up to get a bit of immortality! Plus, it’s neat. You get to show it to your friends and brag! $200 - Original Artwork – You will receive access to the blog, a PDF and physical copy of the graphic novel, ‘Behind The Scenes’ updates, a print copy of the script, plus a full-color COMMISSIONED CHARACTER ART piece. Tell me what you who you want drawn and where they are and I’ll make it. It could be a character of your own design, a historical figure or even your favorite D & D character. Whatever you like! A high quality print will be mailed to you as well as a digital copy. This one I chose as a buffer between levels. I needed something around the $200 mark and a commissioned piece seemed to be a good choice. Lots of artists seem to have this somewhere on their Kickstarter campaigns. $500 - Your Character Poster – You will receive access to the blog, a PDF and physical copy of the graphic novel, ‘Behind The Scenes’ updates, your likeness will appear somewhere in the graphic novel, plus you will be mailed a 24 x 36 inch full color FRONT COVER POSTER featuring your character in the center. Similar to the existing cover, but with your character as the star. This will be a one of a kind item and you get the original photoshop file as well! This is a bonus level that offers the same as the $100 but you get a sweet poster of you as character in the setting to really brag to your friends. $1000 - A Starring Role – You will receive access to the blog, a PDF and physical copy of the graphic novel, ‘Behind The Scenes’ updates, a print copy of the script, plus your likeness will be used for a CHARACTER in the graphic novel! You will have dialogue and interact with other characters. Again, you may need to be altered to fit into the setting, but it will recognizably be you! A lot of photos are required to participate at this level. You may be required to send specific poses (from home with a web cam or some other easily e-mailed media). This one is in the high-end and I didn’t really expect to get any (though I did). I use photographic reference throughout the book and thought it would be something really amazing to have a backer portray one of the characters from the story. This will require some serious back and forth to get the right pictures, but at this level it’s worth the effort. $2000 - You Are In The Future – You will receive access to the blog, a PDF and physical copy of the graphic novel, ‘Behind The Scenes’ updates, plus a character will be BASED ON YOU in the graphic novel! Not just the way you look, but you. Your name, your likes, your dislikes. 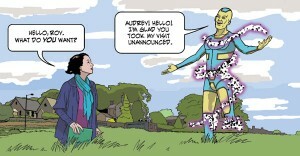 A future version of you will exist and interact in the graphic novel with the other characters. Again, you might be tweaked to fit into the setting, but it will recognizably be you! A lot of photos are required to participate at this level and we’ll need to chat so I can get the scoop on you. You may be required to send specific poses (from home with a web cam or some other easily e-mailed media). You will also need to be a bit flexible, so we can fit you into the story and setting. I was told to always do a pie-in-the-sky level because you never know. I think this is really, really special. It would actually require me to rewrite part of the book, but again, if someone is willing to put that kind of money into the project, I’m willing to work with them. Figuring out your backer levels is tough. You have to factor in what people want, what you would have to do for it and what’s cool and exciting. It’s always good to look at what other projects have done and look at their successes and failures when putting together your Kickstater project. This entry was posted in Columns and tagged backer levels, chris lackey, indie comic books, kickstarter, kickstarter comics, transreality. Bookmark the permalink. Follow any comments here with the RSS feed for this post. Post a comment or leave a trackback: Trackback URL.